For almost 50 years the Haynes Owner’s Workshop Manuals have been a great source of information and frustration for amateur mechanics, offering a guide on all manner of tasks from simple servicing to more complex repairs for all the most popular models of the day. While this latest title, the second in the F1 series which they introduced with the Red Bull RB6 manual last year, matches the traditional Workshop Manuals perfectly on the shelf in it’s JPS inspired black and gold colour scheme, inside it deviates from the standard formula. With a total of just nine Type 72’s being built over the cars 6 seasons in service with Team Lotus a pure Owner’s Workshop Manual would have been aiming for a bit of a niche market, but fortunately there is plenty here for anyone with an interest in the classic F1 cars and the people who designed, maintained and raced these fascinating machines. Inside the book covers the history of how the Lotus 72 came to be developed – from the early years of Lotus in F1, the development of the 72’s predecessor – the Lotus 49 – and the Cosworth DFV engine they both shared, and the ups and downs over it’s racing life and the stories of the cars drivers and designers, including the likes of Jochen Rindt, Emerson Fittipaldi, Ronnie Peterson and Lotus founder Colin Chapman. This is a car which took two Drivers World Championships and three Constructors Championships, but also saw the death of Jochen Rindt and a later decline in to obsolescence. Of course the real meat of the book comes in the “Anatomy of the Lotus 72” section, where all aspects of the car are examined in detail, looking at the design theory and real world workings of the car from the basic chassis through to the aerodynamics, driver controls, suspension, brakes, wheels and tyres, engine, gearbox and electronics. 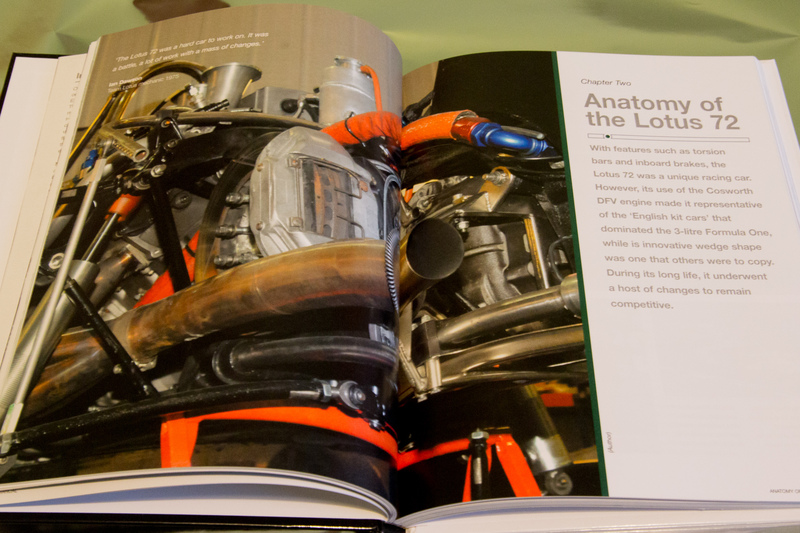 The descriptions are accompanied by a fantastic selection of engineering diagrams from the Classic Team Lotus archives and both modern and period photography. These help the reader to understand how this car, the legacy of which carries through even to modern F1 racers, worked as well as how it was developed over the years to keep it competitive. There are also interviews with the surviving drivers and mechanics giving a unique insight in to how it was to drive and work on at the time, along with modern day historic racers and mechanics talking about the difficulties in running and maintaining 40 year old race cars. Finally the book looks in to logistics of owning a Lotus 72, the current status of the nine existing chassis’s and their race histories. While this Owner’s Workshop Manual might not provide you with step by step instructions on how to carry out an oil change or change a brake disc (in fact I don’t recall reading the words “Assembly is the Reverse of Disassembly” once!) 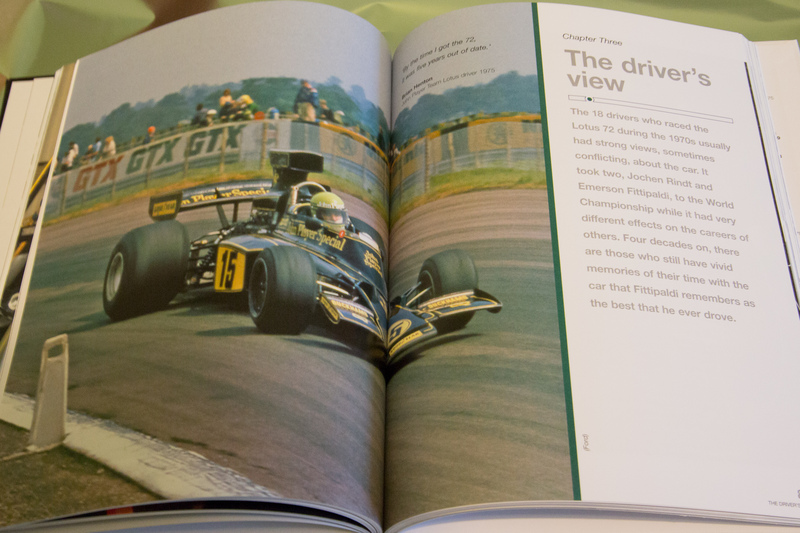 it’s a great read, full of interesting facts, it would make a great gift for anyone with an interest not just in Lotus but classic race cars in general. 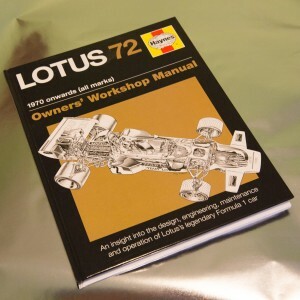 The Haynes Lotus 72 Owners’ Workshop Manual is available from the Classic Team Lotus store, as well as many other good retailers.